A new generation of welding protection eyewear available with different grey-tint lenses and various protection classes. The innovative technology affords protection from UV and infrared light while maintaining perfect colour recognition. 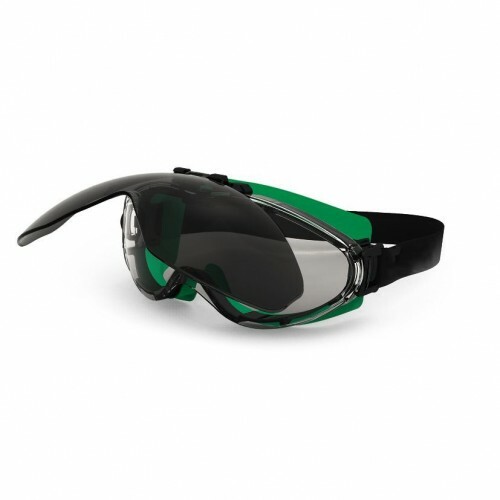 The special infradur AF coating of the uvex ultrasonic flip-up 9302 safety goggle has anti-fog properties which prevents the inside of the lenses misting up and the extreme scratch-resistance on the outside keeps damage from welding sparks to an absolute minimum. The new welding safety goggle uvex ultrasonic flip-up 9302 fits the face perfectly and is extremely comfort – enhancing the wearer’s experience. Wide-vision safety goggles with exceptional wearer comfort. Combines hard and soft components which adapt to the wearer’s face creating soft, effective seal around the eyes. Supravision lens coating technology – anti-fog on the inside of the lens, scratch resistant on the outside, permanent – won’t wash off. Wide fully adjustable, high quality head strap offers pressure-free fit, even when worn for extended periods. Comprehensive side protection around the eye area, even when worn over prescription spectacles. Indirect ventilation ensures pleasant comfortable interior environment. Sporty safety goggle design with wide panoramic field of vision. Soft materials aid compatibility with respirators and other items of PPE. welding protection with fold-up, easily replaceable filters featuring new filter technology for perfect colour recognition and protection against UV and IR radiation. autoclavable wide-vision goggles with anti-fog coating for use in laboratories, clinics, cleanrooms and food manufacturing: autoclavable safety eyewear with anti-fog coating – specially designed for repeated autoclave sterilisation.